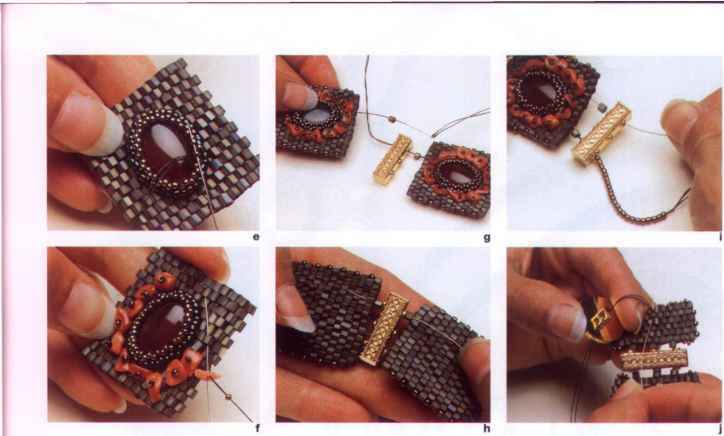 Begin the bracelet by making a peyote-stitch platform for each cabochon. Set each stone onto its platform with beadwork. Next, assemble the bracelet with the spacer bars. This bracelet is 7 in. (18cm) long end to end, and the center platform is slightly larger than the side platforms, which improves the fit. For a small bracelet, 6-6'A in. (15-16.5cm), you might choose narrower spacer bars or set the two end cabochons vertically on narrower peyote platforms. O Thread a needle with 4 yd. (3.7m) of doubled, waxed Nymo B. String an 11° seed bead, slide it about 8 in. (20cm) from the end, and tie an overhand knot around it. This is the stop bead, which will prevent the other beads from falling off. Remove it later and weave in the tail. © Pick up an even number of hex-cut beads (here, 14) and slide them to the stop bead. 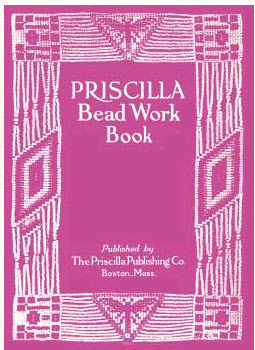 © Pick up a hex bead (#15) and pass the needle back through #13, skipping bead #14 (see "Basics," p. 5 for even-count flat peyote stitch). Continue peyote stitching to the end of the row (photo a). © To start the next row, pick up a bead and pass the needle back through the last bead added. Pick up a bead and pass the needle through the next high bead. Continue peyote stitching in this manner until you've completed an even number of rows (22-26) and the piece is at least four rows wider than the cabochon. O Center the stone on top of the peyote-stitch platform. 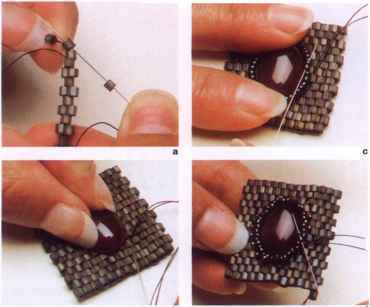 While holding it in place, stitch through the beadwork to one side of the stone (photo b). © Pick up as many 11" seed beads as it takes to go around the stone; make this an even number. Go through the first 11° bead again to form a loop and pull the thread tight so the loop fits the stone snugly. through the next bead on the first row of the loop and then the first bead added in this row (photo d). For thin stones, one more row of peyote stitch will be enough. Finish by passing the needle through all the beads of the last row and pulling the thread tight (photo e). Q Stitch through the bezel and into the platform. 0 Embellishment: Surround the bezel with stone chips, each secured with a 14-15° bead (photo f). You might also work a row of 11° seed beads between the beads of the first and last rows on the platform. If desired, work the corner trim shown in photo j now: Sew three 14-15° beads between the two corner beads on all four corners of each platform. © Make two more platforms, set the other two cabochons, and embellish. Make the center platform larger than the others, if desired, by beginning with 16 hex beads, rather than 14. © Hold the stone in place as you attach the bead loop around it to the platform as follows: Pass the needle through the closest hex bead In the platform and then through two beads in the loop (photo c). Skip one or two hex beads and go through the next hex bead. 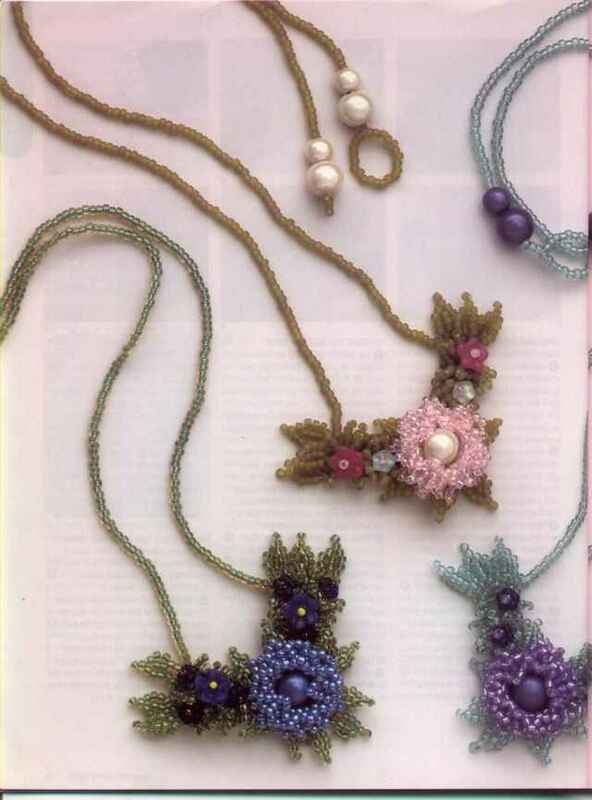 Skip one or two seed beads on the loop and go through the next one or two seed beads. (Note: the curve of the cabochon will dictate how many beads you skip and which beads you go through. At the ends of the stone, where the edges are parallel to the holes of the hex beads, you'll have to go around the thread between hex beads.) © Go through all the loop beads again and pull the thread tight. © Unless your stone is thick and hasn't begun to round yet, begin the second row of the bezel with 14-15° seed beads and work in circular even-count peyote stitch (see "Basics"). (If the stone is thick, you may need one more row of 11 °s.) Pick up a bead, skip a bead on the loop, and pass your needle through the next bead on the loop. Repeat around. note where the holes on the spacer bars align with the hex beads. © Bring the needle on the first platform out the hex bead that aligns with the top hole on the spacer bar. Pick up a hex bead, go through the hole on the bar, pick up another hex bead, and go into the same hex bead on the second platform (photo g). © Weave the needle back and forth in the second platform so you can go back out the same hex bead you entered. Go through the beads and spacer bar and into the bead from which you began on the first platform (photo h). O Weave over on the first platform and exit the hex bead that aligns with the center hole of the bar. Pick up a hex bead, go through the bar, pick up another hex bead, and enter the appropriate hex bead on the second platform. Repeat step 3. © Repeat step 4 going through the bottom hole on the bar. If you have at least 18 in. (46cm) of thread left, do not end it. If a short length remains, end it and begin a new one. © Repeat steps 2-5 to connect the second spacer bar and the third platform to the second platform. O Go back to platform #1 and weave around the platform to exit the hex bead on the other edge that aligns with the bottom hole on the third spacer bar. Pick up a hex bead, go through the hole on the bar, and string enough 119 seed beads to make a loop that fits over the button. © Sew through the top hole of the spacer bar, pick up a hex bead, and enter the appropriate hex bead on the platform (photo i). Weave the needle back and forth to exit the same hex bead and go back through the spacer bar and loop to reinforce them. © Weave the needle through the platform to exit the hex bead that aligns with the center hole on the bar. Pick up a hex bead, go through the center hole, string a stop bead (an 11s or a 14"). Skip the stop bead and go back through the hole. Weave the needle into the platform to secure the thread before cutting it. How to wrap a stone with peyote stitch? How to Stitch a Peyote Bezel Around a Cabochon With a Backing? How to make cabochon peyote? Where can i find a peyote weave bracelet directions? 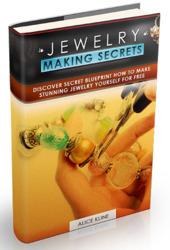 How to attach a cabochons. to a bracelet? How to peyote stitch hexagon? How do i make peyote hexagon beaded? How to make photo into peyote bracelet? How to make peyote ring? How many #11 seed beads to 1 inchfor peyote stitch? How to make a bracelet out of string with 2streams 2rows of beads? How many 11o seed beads for circular braclet? How to work circular peyote stitch? How to make a peyote starter? How to add a cuff onto peyote bracelet? How to bead in circlur? How to do makeacircular peyotebracelet?